Is Roatan Drinking water safe? Are there sharks in Roatan? | We LOVE Roatan Blog!! 1) Is it safe to drink the water in Roatan? It really depends where you are, but to be safe I would say only drink bottled water. Washing veggies and brushing your teeth is fine with tap water (typically well water). There are a few resorts that say you can drink their water and I believe it to be true. They are putting their reputation on the line and wouldn’t do so haphazardly. If you are renting a house in Roatan you can just get a 5 gallon Sun Water jug from the grocery store or any little shop. They only cost 35lps to 50 lps which is about $2.50 and the pumps cost about 100 lps ($5). 2) Are there sharks in Roatan? A better questions is are there dangerous sharks in Roatan? The answer is no! Roatan has nurse sharks, reef sharks and hammerheads which are not considered dangerous. 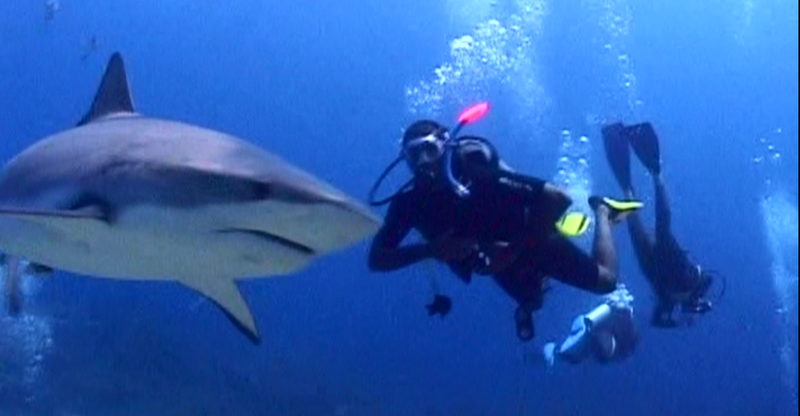 They wont even get close to you unless you are doing the Roatan shark dive. You might see a nurse shark but they will most likely be asleep on the reef bottom. As far as tiger sharks, bull sharks and great whites there haven’t really been any sightings. Not unless you are doing something you shouldn’t be. I consider the island to be very safe and have traveled the better part of the world. There are areas which you should avoid at night time but that’s true in every major city. The West End and West Bay are very safe day and night. Sandy Bay is pretty spread out so it really depends where you are. Coxen hole and Flowers Bay are fine during the day but can be a little sketchy late night. A lot of the negative stereotypes come from the mainland of Honduras which has a high crime rate. THIS IS NOT ROATAN! Its like comparing Harlem to Hawaii. The island is its own microcosm and not affected by it. Roatan does have its social issues so try not to be too flashy. There is a crime season which stretches from late September to late November. This also coincides with rainy season in Roatan and when the cruise ships slow down. As money gets a little tight crime shoots up, but drops just as quickly when business comes back in December.